A fine art print of "Folly Beach at Dawn" will add a peaceful and colorful seascape to your office or living room. The brilliant sky is streaked with orange, pink and blue as dawn approaches. The waves have a muted sound, growing as the sky warms. Silhouetted shapes of the erosion control piers begin to take form. The real world melts away in a burst of surf, sunlight and seagulls. 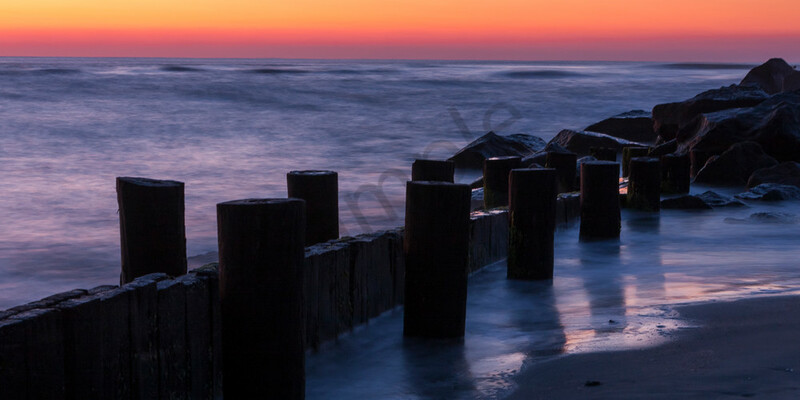 This fine art print of "Folly Beach at Dawn" is in my beach wall art series. It fills your room with the carefree spirit of the sea! Displayed on metal, the bold colors and vivid details captivate the imagination. Each metal print is ready to hang without a frame, providing a bold, modern look. For a softer, more pastel appearance, choose a canvas print. Two museum-quality fine art papers are also available, should you prefer a more traditional look. The sky is brilliant as dawn approaches. Erosion control groins create a striking silhouette. Photo was taken on Folly Beach, SC.